Dr. Energy Saver specializes in identifying the sources of these problems in your home and providing complete air sealing services. We can help you eliminate leaks and make your home more comfortable and efficient. If you're interested in air sealing for your home, call us today to get started! Why are air leaks so common in homes throughout the country? The answer is simple -- they're built that way. Every joint where walls or floors meet, every screw and nail hole, and every plumbing, electrical, and even HVAC installation has created a gap that allows air to exit or enter the home. There's almost nothing that the contractors who built and have worked on your home could have done to prevent these small gaps and leaks. 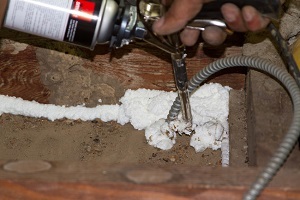 However, you can eliminate these issues with air sealing from Dr. Energy Saver. Ducts: One of the most important source of air leaks is actually the ductwork system. Leaky ducts allow conditioned air before it reaches its destination while also pulling in unconditioned air from the attic or basement, depending on where your ducts are. This means your furnace or AC unit has to run longer to get the air to the temperature you want. If you're having problems with uncomfortable rooms and high heating and cooling bills, the home insulation experts at Dr. Energy Saver are here to help. We can test your home for air leakage problems and provide you with the air sealing services you need. Contact your local dealer today for an estimate!